Hey Happy Monday everyone! Hope you all had a great Easter holiday and the Easter Bunny brought you lots of tasty treats! So whats new with Amaretto this week? Well…………I am happy to announce our next fund raiser!! 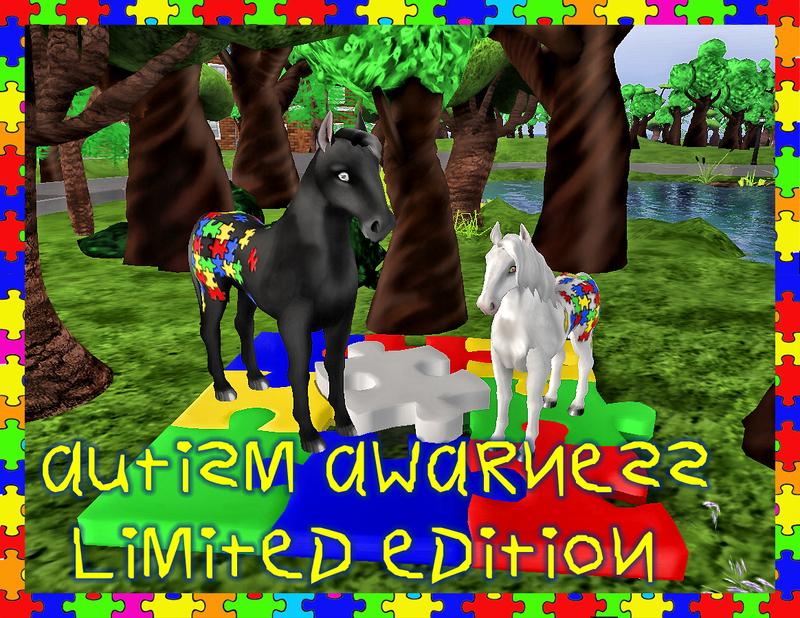 Now available are the Limited Edition Autism Awareness Horse and Limited Edition Springtime Horse!!! Yes you read that right! We have decided to combine our 2 Limited Edition Springtime horses and 2 special Autism horses together for this great cause. With 100% of the funds raised going to help children throughout the world that live with Autism everyday. For 5 days from Monday April 25th to Friday April 29th you may purchase these special horses at any of the locations listed below. The horses will all be sold for L$1,125 each. So check your notices for the notecard with all the landmarks and lets raise lots of money for these kids! This is something near and dear to my heart, so please support us in this event! Please take the time to educate yourself on Autism because this affects thousands of children and adults all over the world!! Happy Breeding everyone and enjoy the new Limited Edition Horses!!! !